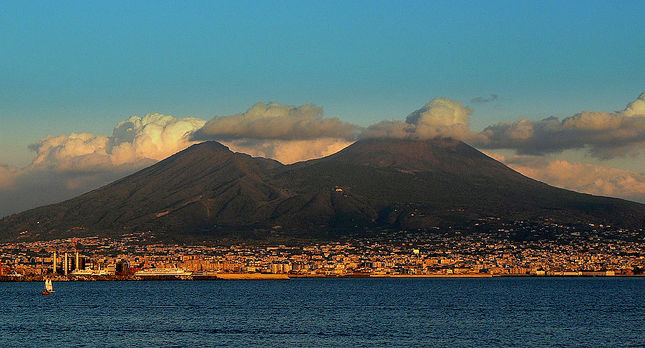 Vesuvius is in Campania, which is the 3rd largest region in Italy. Naples, known as Napoli to the Italians, is the capital of this region. The current population of the City of Naples is just under a million but there are nearly another 3 million people living in the wider urban area. 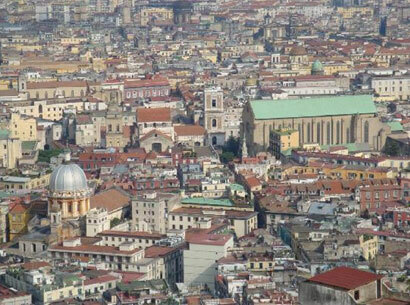 Naples is Italy’s 4th largest urban economy and ranks 103rd richest city in the world. The port of Naples is very important, Hong Kong being the only port in the world with a larger passenger flow. This means that the area attracts huge numbers of visitors and tourism contributes significantly to the area’s wealth. The climate is common with other Mediterranean regions with mild, wet winters and warm dry summers. This climate made the Gulf of Naples a holiday centre as long ago as Roman times, when emperors Claudius and Tiberius stayed there and today people from all over the world do the same. 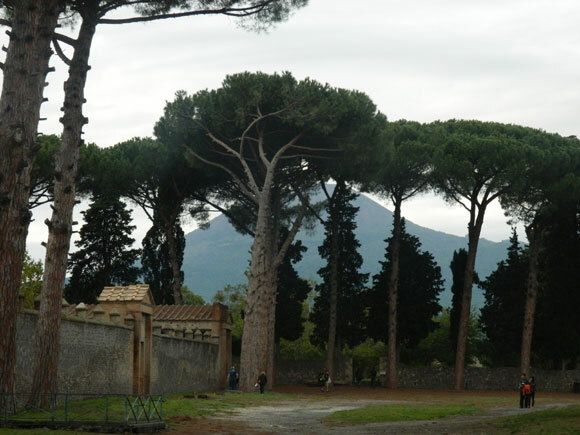 Mount Vesuvius is just north of the historic site of Pompeii in Italy. It is 4203 feet high and sits on the African and Eurasian plates, on a collision plate boundary. Vesuvius is part of the campanian volcanic arc, which is a line of volcanoes formed on a subduction zone. 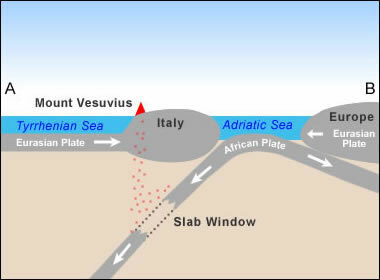 The subduction zone was created by the African and Eurasian plates and stretches the length of the Italian peninsula. Underneath Vesuvius, the bottom part of the subducting slab was torn and separated from the top of it; this makes the rocks in Vesuvius slightly different from rocks found in other campanian volcanoes. Vesuvius is a stratovolcano which is quite common. Stratovolcanoes tend to erupt now and again so if the volcano doesn't erupt in a while then pressure builds up and it is eventually bound to blow. On the 24th August 79AD at about noon Vesuvius started to erupt. There was a huge column of smoke, rock and ash that grew 20km in the air but then fell south covering the towns of Pompeii and Herculaneum. Many houses collapsed by the falling rock and some people were killed by the collapsing buildings. By the morning of August 25th all the buildings had collapsed and an evacuation plan was in force for the survivors of the impact. Then a deposit of ash, which was 10cm to 20cm thick covered the towns by the pyroclastic surge*. It was closely followed by a pyroclastic flow* which left 2 metres of ash. All remaining people had been either incinerated or suffocated and there were no records of survivors. Between 15,000 and 20,000 people died and the communities were eventually covered in 3 metres of volcanic ash. People who had evacuated in time would have lost their homes with no hope of being able to return and rebuild and were forced to find somewhere else to rebuild their lives. The global climate was affected for nearly 2 years due to the ash entering the climate system, causing sunlight to be blocked and cooling the earth. * Pyroclastic flow : A pyroclastic flow is a high speed avalanche of ash, rock and gas that move down the side of an erupting volcano; they can reach 800°C and move at speeds up to 150mph. * Pyroclastic surge : A pyroclastic surge is more powerful than a pyroclastic flow and is made of searing gas and rock fragments. The surge moves easier up and over ridges than flows and they contain a lot of lethal toxic gases. What could be done today to protect the area from future eruptions? Vesuvius is an active volcano and another eruption on the scale of 79AD could see millions of people homeless and tens of thousands dead. Geologists and volcanologists who study Mount Vesuvius say it is overdue a major eruption. 24 hours a day the Vesuvius Observatory monitors seismic activity, gas emissions and other indicators, so that they are ready to alert the authorities at the earliest they can. When Vesuvius erupts again on the same scale as the 79AD eruption those living within a 9 mile radius would be killed. In 2004 the government called this area the "red zone" and offered about £25,000 for people to move out of the area - very few have accepted. Experts believe the Italian government haven't done enough to protect people. They argue that the dangerous burning ash and pumice could fall over the city of Naples which is only 3 miles outside the "red zone". 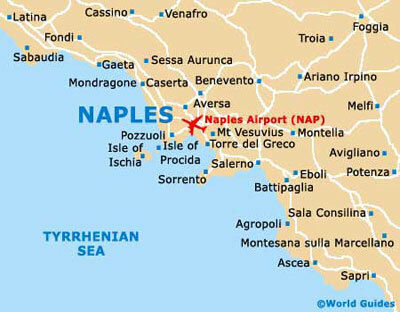 Too close for comfort - Naples is just twelve miles from Vesuvius. Here is a video I made of photos and videos I took in Pompeii when I went with my family in October 2012. The music in the background is My Heart Will Go On from Titanic, which is played by me on the piano. I chose this because it is a sad song and it was devastating how so many people perished in 79AD. It's amazing how you can go to a place which was destroyed so long ago and you can still see the pictures and colours on the walls and the mosaics on the floors. For me, volcanoes are an exciting thing to learn about because although they are deathly dangerous they are beautiful at the same time. Here is another video I made about a volcano called Solfatara, just north of Naples. It was amazing to go and see because it has boiling mud and lets out hot steam but the smell of sulphur was awful! I like geography, history and photography and I have enjoyed doing this project and learning about volcanoes.